Check out Cameron Diaz in her motostreet jeans. This seasons must have jeans. As for Kate Moss it seems as if she had just stepped off of her street bike when really just an average day for the trendy supermodel. I want that biker jacket! And these Balmain boots, this is definitely my splurge item of the season! To top it all off, the Marais crossbody bag with exposed metal zippers. Edgy AND functional! The August issue of Allure is out, and we are in it! 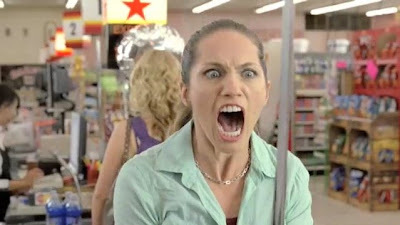 I was just doing my monthly magazine routine, which includes browsing the latest trends, and catching up with the most recent celebrity gossip. I was so excited to see our bag in my favorite part of the magazine, Fashion Cravings. Motorcycle Diary is such an electrifying look and I think it represents Marais very well. 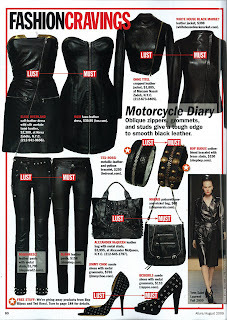 Even while in a motorcycle rally you can still accessorize with our bag and keep the same tough, edgy style. The most romantic destination ever, has to be Paris, France. You know, the charming outdoor cafes to sit and sip an espresso and watch all of the chic people walking by. In all of my travels, The Marais is the most inspirational arrondisement in all of Paris – it just exudes creativity and fashion. The people know how to mix modern pieces with vintage and come across elegant. While I am there, I only worry about packing my skinniest J brand jeans, an easy top and jacket, then I accessorize; my broken- in Sergio Grasso riding boots (perfect for an entire day of walking and shopping), a vintage Hermes scarf and, of course, a bag from one of our collections! It’s always the bag that makes my outfit – it is a fashion MUST! I carried this one on my most recent trip, it kept me hands free to carry lots of shopping bags! 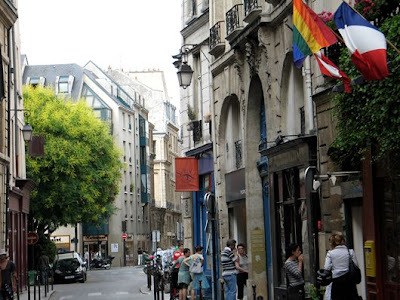 Check out this video I found on style.com that gives a real feel for le marais…. The inspiration behind our brand. A bientot!! Sadly, I'm back from my summer vacation. A full week spent lounging on the warm sandy beach, everyday was a perfect one. All I needed was my striped Vitamin A bikini and my perfect beach bag to fit the days necessities; sunscreen, hat, ipod, cell phone, book, bottle of water, and even a few snacks. I found this bag to be just the thing, in fact, it was probably the best item I took with me. My lesson learned is that the perfect bag is a necessity whether you are on that first date, trip to the grocery store, or just laying on the beach.